Four reports are now available that cover the outcomes and learning about a large philanthropic investment in an innovative community-led approach to finding long term solutions to realising the educational aspirations of Maori and Pacific communities. Kate McKegg discusses Developmental Evaluation at the Collective Impact 2014 Conference. The 7th The African Evaluation Association (AfrEA) conference ‘ Evaluation for Development: From Analysis to Impact’ was held in Yaounde, Cameroon from 3-7 March 2014. Over 500 delegates attended from all over Africa, as well as from India, Russia, Europe, the UK, the USA, Australia, South America and New Zealand. Two days of workshops preceded the conference. Over 20 workshops were held over these two days, in English and French on topics such as Developmental Evaluation, Participatory Evaluation, Human Subject Protection, Public Policy Evaluation, Role of Randomized Evaluations, Reporting techniques for Evaluators, Equity Focused and Gender Responsive Evaluation, Managing Evaluation, Evaluation under Constraints etc. Founded in 1999, in response to Africa’s growing appeal for advocacy, information sharing and advanced capacity building in evaluation, AfrEA is an umbrella body for more than 30 national Monitoring and Evaluation associations and networks in Africa. It is also a resource for individuals in countries where national bodies or Voluntary Organisations for Professional Evaluation are absent. I was invited to attend AfrEA to deliver a Developmental Evaluation workshop with Michael Quinn Patton. Michael Quinn Patton beamed in to the workshops via Skype for 2 hours giving people attending the workshop a chance to engage with Michael, even though he couldn’t be there in person. The workshop was full with over 45 participants attending, from all over Africa, the USA, Europe, and India. The second half of the workshop was more applied, with participants applying systems thinking, complexity concepts and Developmental Evaluation tools to their own projects and situations. The Conference opening and subsequent three days of papers, was held at the Palais de Congres – a location with spectacular views of Yaounde. After a slightly rocky start to the Conference, members of the AfrEA board opened the conference, due to the Cameroon Minister being unable to make the opening ceremony; and three days of high quality, diverse conference sessions began. The content of sessions was varied and interesting and almost all the presentations I attended were of very high quality. I was particularly impressed by the considerable development of evaluation systems and policies occurring in countries in Africa. Since the last AfrEA conference two years ago in Ghana, several African countries, including Uganda, Kenya and South Africa appear to have made significant strides in engaging their governments in evaluation policy making and the development of evaluation infrastructure to commission, do and report on evaluation is impressive. Engaging governments in evaluation was a major theme of the conference, and a very successful ‘Parliamentarians forum’ was held over several days, where several parliamentarians from South Asia, and Africa came together to discuss ways of advancing the enabling environment in government for nationally led evaluation policy, structures and processes to support effective development results. International and national efforts to strengthen evaluation associations was a key theme of the conference also, with several papers describing the challenges of establishing and maintaining evaluation associations many of which seemed familiar to our own context e.g., engaging busy volunteers, funding for operations, strengthening links to government and other funders, ensuring relevance to evaluators and communities etc. There were several papers exploring evaluation standards, quality and competence, from pan African, national, local and tribal perspectives. One of the drivers for this strand of papers appear to be pressures evaluators feel as they juggle the various quality standards of from donors and funders, governments and evaluation associations. The question of the extent to which these standards actually contribute to higher quality evaluation was raised as something that needs research. BetterEvaluation sponsored a strand of papers on methodological innovation which was rich with new ideas and approaches including the use of propensity score matching, a cross sector ‘expert panel method’ for thematic international evaluations, the use of the web based tools, phone technology and social media. A whole strand on technology-enabled monitoring and evaluation highlighted the innovative use of mobile technology to reach large and diverse populations, with a number of papers focused on ways of engaging and reaching young people. The challenges for evaluation of poverty, political instability and conflict were evident in many of the papers given, with human rights and food security also key themes of the conference. The question of whether evaluation makes a difference was raised in one session and in this vein, Evalpartners was promoting an initiative called ‘Evaluations that make a difference: Stories from around the world’ . New Zealand was noted as being a country where innovation in evaluation is occurring and we were encouraged to participate in this initiative. The initiative is seeking submissions on evaluations that have really made a difference. The submission deadline is April 15, and I encourage you to consider submitting a proposal. 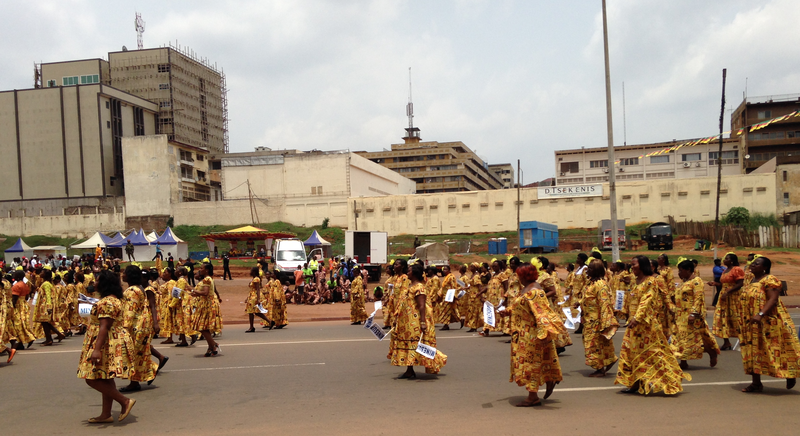 We left Cameroon on Saturday the 8th of March in festival mode, as the country was swept up in the festivities of International Women’s Day. As we travelled from our hotels to the airport, parades, music and celebrations filled the streets. In a world faced with unprecedented rising levels of inequality and injustice, is there a responsibility for evaluators to do more to promote inclusive, evaluative dialog and deliberation about the state of our democracies and our democratic principles and ideals? What role and stance might or should evaluators take in relation to citizens’ growing concerns about the failure of key democratic ideals, such as participation, equity and social justice? In the face of such overwhelming evidence of growing inequality and injustice, should evaluators be turning their attention to supporting a broader evaluative critique of the state of democratic ideals in our societies? New Zealand is not alone among so-called democratic nation states in demonstrating a worsening picture of inequity and injustice. There seems little to celebrate about the lived reality of democracy in 2013 for so many of our global citizenry. It seems to me that for those of us who consider evaluation to be a democratising practice – with the goal of social betterment – it is a critical time for evaluators to consider their location, role, and stance in relation to the pursuit of key democratic ideals. I believe that collectively we can probably do more, than if we try and tackle this job alone. Perhaps we should demand of our evaluation organisations that they develop a collective body of critique on the state of our democratic principles and ideals? Our professional associations could perhaps fulfill an important leadership and facilitation role in processes of dialog and reasoned deliberation and interpretation of our countries’ commitment and results in relation to participation, equity and social justice. Is this just a naive idea with no possibility of realisation?